Sponsors: www.josera.de, www.rafting.de, www.radsport-zellner.de , Sport Hochreiter Inzell. Sleddogsport.info: What equipment do you use? Andy Birkel: Danler Sled´s for race and training. Flauger for carttraining. Harness and lines from Helmut Peer. 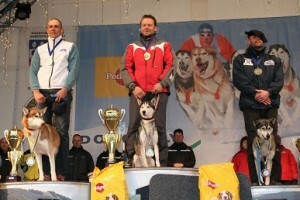 Sleddogsport.info: What you feed your dog? Andy Birkel: I feed Josera. In my mind one of the best High Energy product for dogs. Sleddogsport.info: The number of your dogs? Andy Birkel: At the moment we got 11 dogs. 4 old dogs and 7 racedogs. In Nov. is coming a new puppy from Stepan Krkoska. All racing dogs are from Reebook´s and Trinity lines. Andy Birkel: SSB for FISTc and SC Weissbach for WSA. Sleddogsport.info: First start on the competition? Andy Birkel: My first start was in 1997 in Langtaufers South Tyrol in Cat. Skijöring . Sleddogsport.info: 3 best sporting achievements? Sleddogsport.info: The most beautiful trail to the contest? Andy Birkel: One of the best racetrail in Europa is Auronzo in Italy. Sleddogsport.info: The most difficult trail on the contest? Andy Birkel: Difficult was last year Donovaly. I started 2004 and 2006 in Innerkrems MD. The trail was high up in the mountains and the “downhill” was sometimes very difficult. Sleddogsport.info: The place where you train? Andy Birkel: During the wintertime I train the dogs on the nice skating trails around my hometown. I got a license to do that. With cart also around our small town. Sleddogsport.info:What do you like best in this sport? Andy Birkel: When you come to the finish line after a hard race and the dogs are still happy. Than the training and all the stuff around was perfekt. Sleddogsport.info: What in this sport’s most annoys you? Andy Birkel: When some musher use the dogs like cars. Put them out, run them and nothing else.We love our dogs. Sleddogsport.info: Do you prefer take-offs on proven trails and good places or rather more new places and new trails? Andy Birkel: Every new trail and place need a chance. Sleddogsport.info: What do you think about the division FISTC and WSA: Why you dont participate in WSA championiships, when its legally possible for you even as a FISTC member? Andy Birkel: I for myself participate always on FISTC Championchips but from the new season 2011/12 I change to WSA because there are some guys in the FISTC who wants only make politic and NO Sport. I´m a musher and I want to make sport against the best other mushers. 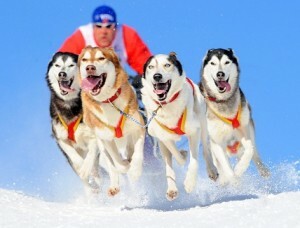 Sleddogsport.info: Do you think you can combine sport chariot fascination with family life? Andy Birkel: I can only say: my girlfriend and me we life for this sport and we got no problem to share our life with our Dogs. Andy Birkel: I like mountainbike and streetbike in the Summer and skating during the Winter. Sleddogsport.info: What kind of music you listen to? Andy Birkel: I like Metallica,Red Hot ChilliPeppers , Kid Rock and other Heavy Metal Stuff. Sleddogsport.info:What do you like best to eat? Andy Birkel: I like Italy and German food. Sleddogsport.info: Your greatest sporting dream. What do you want to achieve in the future? Andy Birkel: Future main goal is WC in Cat. B1 and always HAPPY dogs.